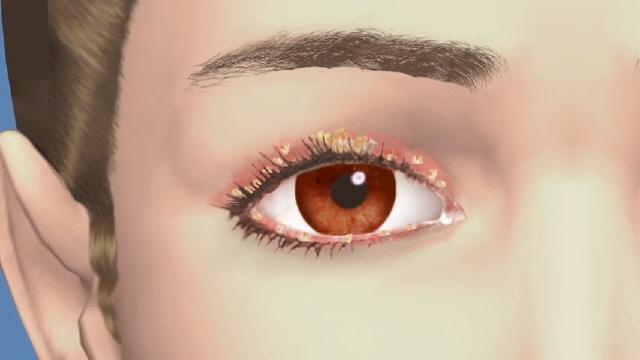 Eyelid Conditions such as Dermatochalasis, Blepharoptosis, Entropion and Blepharitis can affect your vision. Dermatochalasis is a medical condition. It is defined as an excess of skin in the upper or lower eyelid. It is generally treated with blepharoplasty. Droopy upper eyelid or ptosis presents with substantial blockage upper part of field of vision, risk of amblyopia among young children, and dramatic change in the facial appearance. Blepharoptosis is abnormal low-lying upper eyelid margin with the eye in primary gaze. Ectropion is when the lower eyelid turns outwards. It is one of the notable aspects of newborns exhibiting congenital Harlequin type ichthyosis, but ectropion can occur due to any weakening of tissue of the lower eyelid. The condition can be repaired surgically. Blepharitis is an ocular condition characterized by chronic inflammation of the eyelid, the severity and time course of which can vary. Onset can be acute, resolving without treatment within 2–4 weeks (this can be greatly reduced with lid hygiene), but more generally is a long standing inflammation varying in severity. If you have an eyelid condition, make an appointment with your local Alpine Eye Care office today by using our contact form or simply call 1.877.SEE.2020.